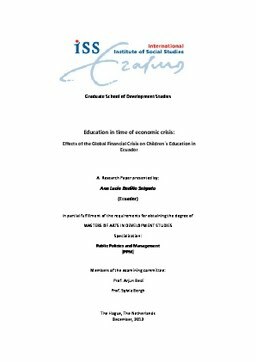 This paper analyzes the short-run effects of the global financial crisis of 2008-2009 on schooling outcomes for children aged 5-14 and 15-17 in Ecuador. We estimate linear probability models using repeated cross-sectional samples of the annual nationally representative employment, unemployment and underemployment household survey over the period of 2004-2010. The study reveals that the global crisis did not affect children´s school enrollment and attendance, but it shifted enrollment towards public schools. We also explore one of the main transmission channels of the global crisis for Ecuador: remittances. We find that the reduction in remittances during the crisis is not associated with decreases in enrollment and attendance for either of the two age groups. Nevertheless, we observe that the fall in remittances affected the choice of school type. In particular, we find that the drop in remittances led to changes from private to public schools for younger children, but not for older children. This suggests that investments in education of older children were protected during the time of the crisis at the expenses of the quality of education of younger children. Several robustness tests and sensitivity analyses were carried out, including a placebo or falsified shock and estimates controlling for the major social protection and education policy in Ecuador.